The pale pink sands of Harbour Island are a sight to behold, while the powder-fine alabaster beaches of Paradise Island are home to soaring seabirds and gently rustling palms. Cable Beach, Nassau, is a prime spot for watersports and beach bars, whilst visitors wanting a bit of peace should take a boat to Stocking Island for less-crowded options. Explore the 18th-century forts and pastel-coloured Georgian architecture of the Bahamian capital on foot or, better still, by horse-drawn cart. Get the steeds to stop while you climb the Queen's Staircase, which is carved out of solid rock and offers superb city panoramas. For fascinating history and culture visit the Pompey Museum and its fine collection of island artefacts and exhibits. Fishing is possible almost anywhere in the Bahamas but the Abacos has become the angler's choice. On hand are top-quality guides (the incomparable Edward Rolle boasts 20 years' experience) to show you tricks of the trade. For bone-fishing Andros can't be beaten and Bimini boasts the best big game. Try the Tongue of the Ocean for a deep-water haul. With street processions, dance bands and a full-on party crowd, the Bahamian Junkanoo festivities on Boxing Day and New Year's Day are the nation's number one party. Nassau's Junkanoo is the liveliest as revellers in elaborate costumes made from crepe paper and cardboard wheel through the streets. There are other great processions in Eleuthera, the Abacos and Grand Bahama. Eleuthera, the jewel of the Out Islands, is where the first colony on the Bahamas was established, so wandering the streets of its charming colonial villages and rolling pineapple plantations is certainly a scenic trip back in time. There are some memorable seafood restaurants to sample here too. Amongst the wrecks strewn off the coast of the Abacos lies America's first steamship, the San Jacinto. Some of the best dive instructors in the Bahamas are on hand in the Abacos to make your dive experience first class. There are also the stone ruins off Bimini, said to be the remains of the lost city of Atlantis, to explore. Inagua, the two islands making up the southern-most part of the Bahamas archipelago, is an eco-lovers paradise, with much of Great Inagua being taken up by the huge Lake Windsor. This is an internationally important bird reserve with an 80,000-strong population of West Indian flamingos. Besides birds, there's limestone caves to explore and excellent scuba diving. The Bahamas' People-to-People scheme helps visitors learn about the cultures, music and oratory traditions of the islanders. Get paired with Bahamian locals of a similar age to enjoy rocking-chair tales, family lunches, church meetings, local bands or just plain out-fashioned sip-sip (local gossip). This 16-hectare (40-acre) protected reserve on Grand Bahama secretes one of the world's longest underwater cave systems which (incredibly given the diminutive size of the park) boasts its own unique wildlife including the Remipedia bat. A great way to see the park's highlights is from a kayak as much of it is made up of navigable waterways. Outside fancy Freeport and Lucaya, the smaller settlements of Grand Bahama are surprisingly low-key. With their wide tree-lined streets, restaurants and cruise port facilities, they are also among the friendliest places in the country. Towns like Eight Mile Rock and McLean's Town are fabulous places to get to grips with real Bahamian culture. Climb to the highest point in the Bahamas on Cat Island's Mount Alvernia, 63m (206 ft) above sea level. Straddling the summit is a photogenic medieval-style monastery, a labour of love by one Father Jerome, who had the steps carved out of solid rock. With high cliffs and emerald forests there's plenty of opportunity for solitude seeking on Cat Island too. It is not known exactly how feral pigs came to inhabit Big Major Cay. All we know is that paddling with these water-loving porkies is one of the more surreal ways to spend a day in the Bahamas. 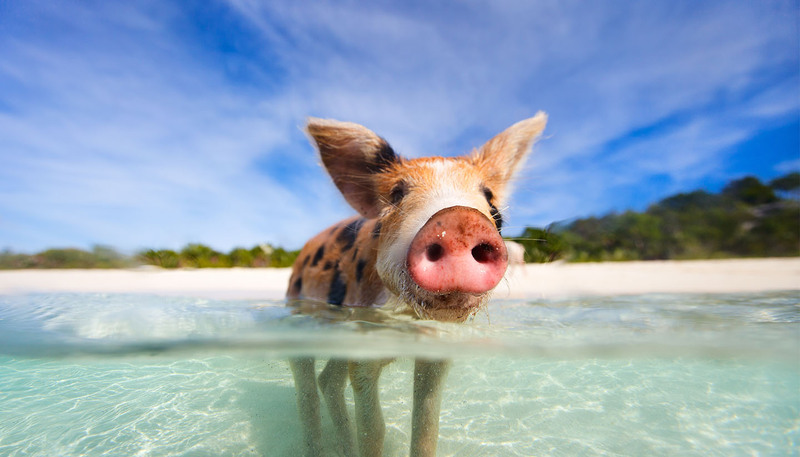 The friendly pigs can be visited on boat trips to the island, which is uninhabited by humans. There are few pleasures in life as simple as sipping rum-laden cocktails (a Bahama Mama is an essential experience) on Abaco Beach at sundown, watching the golden sky turn a dramatic pink-crimson. To add to the magic, fairy lights illuminate the shore as dozens of boats gently bob out in the harbour. Dozens of colourful stalls at Nassau's bustling straw market produce a melee of crowds bartering over handcrafted goods. You can join them, or, for a more sophisticated shop, splash some cash in the swish stores at Bay Street, the brightly-coloured buildings are a haven of designer brands. At Blue Lagoon Island you can interact with sea lions displaced by Hurricane Katrina and frolic with bottle-nosed dolphins in waist-high pools – many played starring roles in the movie Flipper. Whilst dolphin shows in much of the Caribbean have notoriously dubious ecological credentials, this experience is a class above: it's interaction, rather than getting dolphins to perform. The islands have some memorable golf courses, though the Reef Club is perhaps the prettiest. There are five other world-class courses on Grand Bahama Island to choose from including Exuma's Emerald Reef course which was designed by golfer Greg Norman, and the Abaco Club which boasts a Scottish links-style course. For a cheap round on the beautifully kept fairways, play at twilight. Revel in the natural creeks, bird-filled forests, thick mangroves, and pastel-coloured coral on unexplored Andros – the world's third-longest barrier reef, set amongst the Out Islands. At nearly 6,000 sq km (2,300 sq miles), it is also the largest island in the Bahamas. Whether you snorkel, hike or fish, visitors will delight in this untouched gem.